• Leading women in Education Award to the Director General, GLBIMR in February 2017. • Listed in Top 30 B-Schools in India by Entrepreneur. 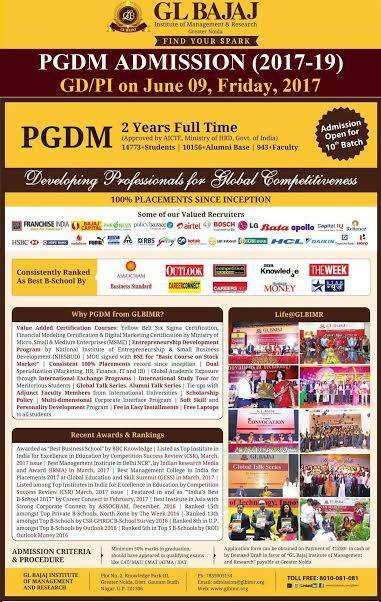 GLBIMR has achieved 100 % Placements in various sectors like FMCG, Retail, Banking & Finance, Hospitality service sector. Our Prominent recruiters are HCL,Airtel, Bajaj Capital, Ceasefire Industries Pvt Ltd, Dell, HSBC,Phronesis Partners, Finedge Advisory Pvt Ltd, Franchise India Limited,Policybazaar.com, Audi ,IndusInd Bank, Just dial ,oppo mobile and many more.